Once you have your GS1 company prefix, you can assign a unique product number to each of your items. The amount of digits you can assign to your product number is based off of your company prefix. The GS1 takes into account the amount of prospective products your company plans on selling when you apply for you company prefix, and bases your company prefix from that. Companies that sell many different items will receive a shorter prefix, allowing them to assign a larger range of digits for their products, while companies that plan on selling a smaller amount of unique product will receive a larger number, limiting the amount of unique product numbers. You need a unique product number for each variety of item you want to sell. For example, let’s say you’re selling t-shirts in two different styles – yellow and blue. 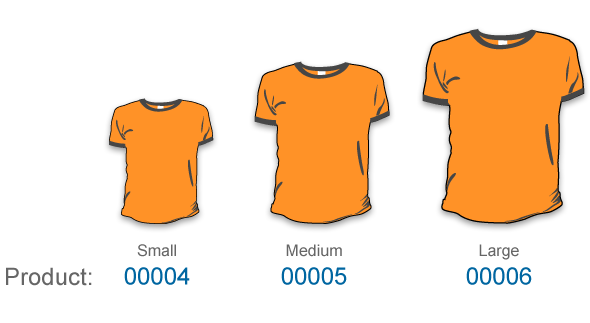 Your blue small, medium, and large t-shirts would each have their own unique product numbers, while your yellow small, medium, and large t-shirts would also have their own different unique product numbers. At the end of this simple tutorial you will be provided information on to obtain UPC barcodes for your products. Click on the link below to continue.